Allen Jay Coles, Jr., was a sergeant in the 320th Barrage Balloon Battalion. Allen Jay Coles, Jr. waited decades to tell his children that he was part of the D-Day invasion. That was a common story among the humble veterans of the 320th Barrage Balloon Battalion, many of whom did not believe that their service to their country, on one of the most momentous days of the 20th Century, was worthy of attention. Sgt. Coles was part of a group of specialized soldiers who landed amid the hellfire of Omaha Beach, charged with anchoring barrage balloons armed with bombs to protect American troops from dive-bombing German aircraft. A native of Brooklyn, N.Y., he was one of the first men to be drafted into service. He joked that it was the only lottery he ever won. After the war, Coles returned to Brooklyn, and to his bride Marion, whom he had married while on furlough the previous December, before the 320th was shipped to the Pacific. They were the only African-American Army unit to serve in two wartime theaters. Back at home, Coles met his 2-month-old son, Allen Coles 3rd. A daughter, Gail, came later. Coles went back to his pre-war job at the Bronx Veterans Hospital, where he worked as an orthopedic technician making plaster casts for servicemen wounded in Korea and Vietnam. In 30 years, he never once called in sick. "You were the angel of happiness to numerous co-workers at the old Bronx VA," one of them wrote to him when he retired in 1973. Then, he and Marion moved to the sunshine in Palm Bay, Florida, where he was able to focus on myriad hobbies such as golf, gardening, and repairing just about anything. Coles died on Sept. 19, 2010, four days shy of his 93rd birthday. "Ask those who knew him and they would say he was uncomplicated, agreeable, fun-loving, quick with a chuckle or a humorous remark, and always happy," Allen Coles 3rd wrote in a eulogy to his father. Allen Jay Coles, Jr., married his sweetheart Marion while on furlough in December 1944, after the Normandy campaign. 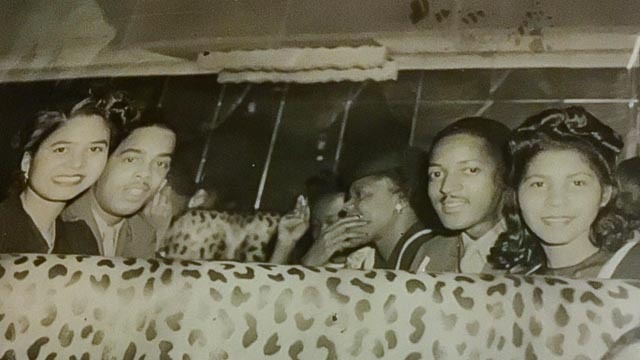 Marion and Allen J. Coles, Jr., with his buddy from the 320th Barrage Balloon Battalion, Wilson Caldwell Monk and wife Mertina at Cafe Zanzibar in New York City. Coles and Monk could not wait to get home from the war to marry their sweethearts.